For over 40 years, American contemporary interdisciplinary visual artist, Judi Harvest has been a leading figure in the art world. Her vast portfolio of works – spanning painting, sculpture, and works on paper – have been extensively exhibited in galleries, museums and international art festivals throughout the Untied States and Europe. Living and working between Venice (a city she fell in love with whilst still an art student) and New York since 1987, Harvest, to date, has had 22 exhibitions and 13 group exhibitions, 14 of which have been in Venice including her 2018 CROSS-POLLINATION: Honeybees + Murano Glass, 2017 Propagation: Bees+Seeds (part of Beauty and the Beast, an exhibition in Palazzo Tiepolo Passi), and 2015’s highly acclaimed Room Of Dreams (part of Dialogue of Fire). In fact, Harvest’s works have quite literally  become monuments, particularly in the European art world. 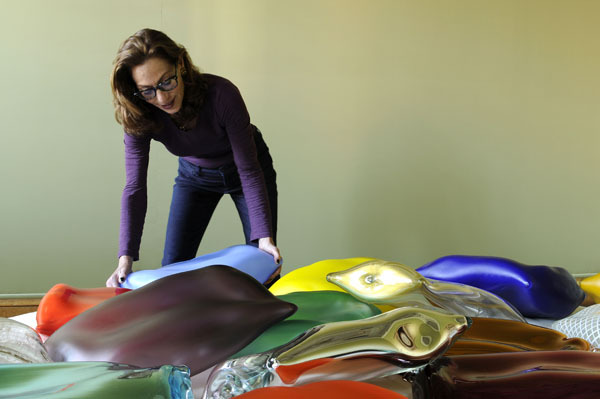 Her widely acclaimed 2003 monumental,  two-ton  sculpture,  Fragmented Peace –– created using ancient Murano glass making techniques with welded stainless steel and inner light – was an outdoor spectacle and made headlines at the 2003 Venice Art Biennale when placed at the San Marco  Vaporetto  stop in front of Harry’s Bar. Fragmented Peace is now in a private collection in Moscow. During the 2017 Venice Art Biennale, Harvest displayed glass sculpture, paintings and video in  PROPAGATION:  Bees + Seeds,  part of Beauty and the Beast, an exhibition in Palazzo Tiepolo Passi, with a particular highlight being the  gigantic critically acclaimed sculpture,  Monumental Beehive. This sculpture was created with chicken wire, air-drying porcelain, bees wax & resin, with sound and light elements. Always a curious and devout experimentalist,  Harvest also created over 1000 different glass seeds,  plants & flowers for the same exhibition. “I created  these seed and plant works in Murano glass to further emphasize the sense of the fragility of life and the search for beauty that underlies all my work.” Working alongside seven Murano glass masters, and employing three ancient and challenging Murano glass  techniques: cera persa (lost wax), lume (flame work), and soffiato (blown), supple, liquid molten  glass is magically transmuted into exquisitely detailed and delicate artistic representations of various animated life forms – the honey bee, a tomato, an open pomegranate  (seeds and all), an olive branch, a tasty-looking coconut in halves, as well as a sparkling, crystalline, frozen honeycomb and frozen wheat, to name a few. These provide a mind-boggling glimpse into her absolutely detailed creative mind of Harvest, imbuing her life-like creations with intricacies and flourishes that are only apparent  (and replicable) from an artist of her caliber. 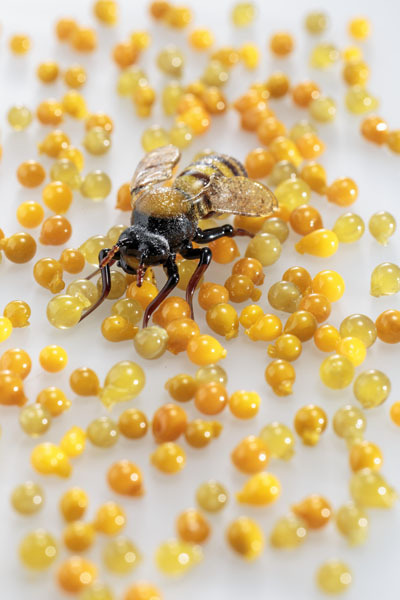 In 2006, Harvest began an extensive ongoing Honey bee series when she heard about Colony Collapse Disorder (CCD), the name given to the worldwide disappearance of Honey bees. Born in Miami and having grown up in gardens (playing with bugs), she also  became a Beekeeper in 2010  and began working with the New York City Beekeepers Association and Andrew Cote. She helps raise funds for the foundation, Bees Without Borders. In 2013 she created a  Honey Garden  in  Murano from a forgotten field behind the glass  factory where she has been working for 30 years. Originally, the garden was conceived for her 2013 Venice Biennale exhibition, “DENATURED: Honeybees + Murano”, to  bring awareness to the two subjects of beauty on the road to extinction, Honey bees and Murano glass masters. 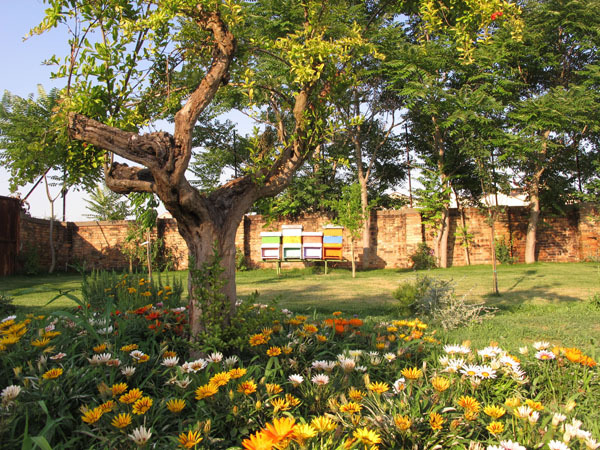 For the  Honey Garden,  Harvest installed four healthy Honey bee colonies in the garden when it was ready. The “forgotten field”, as she calls it, required excavation of  the old soil and broken glass, purchasing six  boat loads of soil, 500 flowering plants,  and 30  fruit trees. She did this all in one month: March-April 2013. For her opening that May, she had 100 bottles of the first Murano Honey. “This is my most ambitious and rewarding  project to date”, says Harvest. To date, the four colonies have grown to eight, and the glass factory is open and creating beautiful work. To build and maintain the  Honey Garden, she sells art work  and, and  what  else? 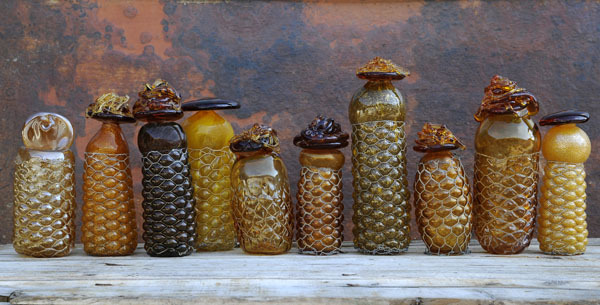 Murano honey; specifically, the 100 unique, numbered “Honey Vessel” sculptures which come with a jar of her Murano Honey with the same number. For the 2018 Venice Glass Week in September 2018, the artist has been commissioned to create what she calls  CENTROTAVOLA VENEZIANO, for The Gritti Palace. This large Murano glass sculpture celebrates the fruits and vegetables indigenous to the Veneto and Venetian Lagoon. 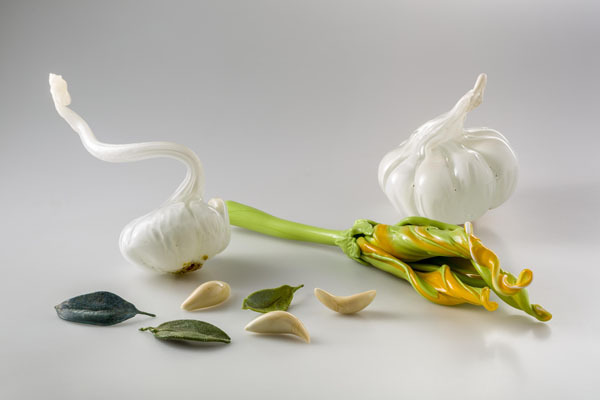 CENTROTAVOLA VENEZIANO will be on permanent display at The Gritti Palace Epicurean School. Judi Harvest’s  “Room of Dreams” Murano glass pillows are currently on display and available at Liz O’Brien Gallery, 305 East 61 Street, New York.